The deep connection you establish with your child starts in the womb. As with pregnancy, bonding with baby develops with time. It, too, is a process that, with your care and attention, will deepen and progress with each passing day. Do you remember when you learned you were pregnant? Surely it was a deeply emotional moment. A second before, you were responsible for yourself and, a second after, you were forever linked to a new being growing inside you. The bond you feel with your baby isn't as instantaneous; it will grow slowly yet steadily during these months of pregnancy until the day you meet your child and begin life as a family. "Bonding" refers to the feelings of love and empathy that parents develop for their children. During pregnancy, sometimes that love is manifested in the form of dreams and fears about your baby and future as a parent. Positive, loving dreams can help you connect with your little one, but fearful ones can diminish your confidence about your baby's health or your own capabilities. Let your health care provider worry about your baby's health. Then give yourself space to deal with your other fears in a way that works for you. Write in a journal or draw pictures of what's going through your head. Share your concerns with your partner as well as with your friends. Expressing your thoughts will help you deal with them and accept your child in your life. Another way to begin bonding with baby is to send them loving messages. 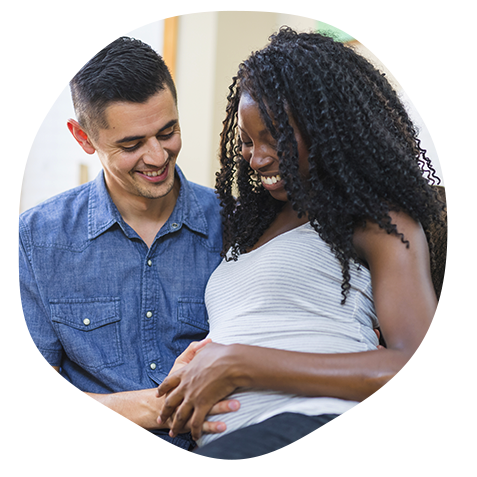 During a quiet moment, put your hands on your abdomen and send happy thoughts and energy to the baby: How excited you are to meet them, what you plan to do when they arrives, how you can't wait to have them as part of your family. Many parents say this activity makes them less anxious and worried about their pregnancy. Your partner is a major factor in how you feel about your baby. If they are excited about your pregnancy, watch out and take care of you, you will likely feel closer to your child. But if your partner is unhappy or hesitant, then you may have doubts and worries too. Your partner may be nervous about being a parent, perhaps being unhappy with their own childhood parenting. That's why now is a good time to talk to them about how each of you grew up, both the good and the bad. Discuss what kind of relationship you had with your parents. You don't just have to start a conversation out of the blue; wait until a situation presents itself. Your friends might tell you they don't have a set bedtime for their toddler, or you may see a couple in the supermarket letting their child select a sugary cereal. Use these incidents as starting points for conversations; discuss how your parents handled such issues and what you would do with your own child. By talking about your upbringing, you can establish a unified front on how you will raise your kids and address any fears that your partner may have about being a parent. You should also discuss your feelings about the baby and how your life will change. When you talk freely about the many changes that a baby will bring to your relationship, finances and lifestyle, you can continue to support each other and see the baby as enhancing your life instead of disrupting it. If your partner feels removed from your pregnancy, try this simple exercise. Put their hand on your abdomen, and, when there is movement or when you sense the baby, have them say, “Hello, baby.” Doing this a few times a day for a week or two, will help them feel more connected to both of you. Bonding with baby doesn't have to wait until they’re born: It really starts the moment that you find out you are pregnant, and it continues throughout your pregnancy. Not only is it a way for you to get closer to your child, it will also help you grow closer as a family. And becoming an even more solid team will help prepare you for your newly bestowed title: Parents.